Ahoj and Greetings from Slovakia. Radostne Vianoce and �tastny Novy Rok (Merry Christmas and Happy New Year). This newsletter is a little later than expected only because of my busy Holiday!!! I especially want to thank the many people who sent cards and packages. I received quite a lot, more on that later though. Please continue to support me through prayer. It helps to know that we are together in the Lord despite however far apart we may be. Please also continue to pray for me and the other young adult volunteers around the world. And of course please pray for the people of Kenya and the violence that is happening there. I know several US volunteers who are there now. They are safe but prayer is very important for them at the moment. December was a rather interesting and eventful month. The advent season is rather big deal here since many more faces start to show up at church and they have special advent services on Fridays. The Pastor had many more projects for me to do, which included decorating; cleaning and making things look just right for Christmas. One of the projects involved assisting the electrician named Janko. We were installing some new lights on the outside of the church. My Slovak is at a point where I can converse fairly well on a basic level. I found out he lives in the village. It seems like I’m always meeting new people and that my Slovak is improving because many people comment on how well I speak but, to be honest I’m only just starting to understand the language. On December 3rd St. Mikula� Day is celebrated, St. Mikula� goes around delivering small presents and candy to little children. He is sometimes accompanied by the devil who takes their treats and whips them if they are bad. Since all Children are Good? They get presents. In the stores they have Chocolate figures of both St. Mikula� and the Devil. One of the ladies in the church, Kristina (She is like everyone�s favorite aunt for all the volunteers in Vrbovce) brought us a small bag of goodies. So, St. Mikula� did visit me seeing as I�m just a big kid anyway. Advent also marked the change in Liturgy. Just when I�m getting used to it, they changed it on me. The people have small hymnals but it is hard to find where things are sometimes because they know the liturgy by heart. I tried asking the pastor once but all he said was that it was in the book. The special advent services on Friday evenings were nice since they are a little more relaxed than Sunday service. There were times left open for people of the congregation to give open petitions of prayer. It was fun to hear children pray as well as moving to hear some of the older generation praying in tears about loved one who are ill. The two other volunteers from Germany, Oliver and Flo went home for Christmas Holiday. Before the Holiday I was waiting for many cards to come but I had to wait until I arrived back to see if they came. I was fortunate enough to be invited to spend Christmas with a Pastor�s family in Ko�ariska, which is another village about 25 minutes away. The wife, Susan, was the Pastor and the husband, Evan (pronounced ee-von), owns some property that he maintains and leases to various companies. The family has 2 little children, a boy Adam 2 and a girl Zuzka 5. They were very well behaved children for the most part. Children are children and they get into mischief. I spent about 5 days with them, it was fantastic. From the time I arrived I felt like I was part of the family. I was constantly being asked if I was hungry. And I tried to speak as much Slovak as I could and most people were impressed with how much I knew. Evan speaks English very well so; I was able to have things translated when I needed. Susan�s parents and brother came and made cookies and dried apples to decorate the Christmas tree or Strom?ek. Of course little Adam would grab them off the tree and eat them from time to time. They arranged for me to do some touristy things in the surrounding area as well. During my stay I got to ride a horse, see wild deer and ram as well as eat the meat, visit a hot spring and see the site of the famous Slovak General �tefanik. It was great experiencing a Slovak Christmas. They also gave me some really cool gifts. Gloves, a scarf (both of which I needed) and a book about General �tefanik. The Children got some big plastic cars and some videos. One Czech film called “Mach, �ebestova and the Magic Telephone” (translated in English) they watched 5 times. The second time we watched it we figured out it had English subtitles. The Christmas Services was very nice and they sing many of the same melodies of Christmas songs I know. I don�t think it really dawned on me it was Christmas until the Christmas Day. One of the traditions I enjoyed was that the family would sing 1 or 2 Christmas songs and prayer before they had their family meals the day before, the day of and the day after Christmas. It was very simple thing but I could sense God�s presence there. �	The Traditional Slovak Meal is Karp; fish about the size of a small turkey can be bought in the stores from huge tanks. �	It is not a Slovak meal without soup; they make a special cabbage soup with Kolbasa (Sausage) and Huby (Mushrooms) called Kapustnica. �	Gifts are given traditionally after the family meal on the 24th. �	Slovak TV is usually filled with old Fairy Tales films from the 50’s -60’s from Czech and Russia and many American TV Christmas movies that are dubbed. So after 5 days of Experiencing the fun and excited of Christmas in Slovakia I headed off to Geneva, Switzerland for the Taize European Gathering. For those of you unfamiliar with Taize, Taize is an Ecumenical order of brothers who are devoted to prayer and dialogue between all Christian faiths for reconciliation located in Taize, France. 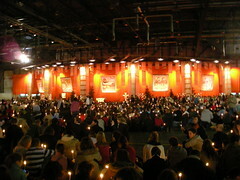 Every year young people come to experience simplicity, prayer and unity in Christ either in Taize or at one of several world gatherings held each year. This year in Geneva there were 40,000 people from all over Europe who came together to pray and share in the unity only Christ can bring. I was lucky enough to arrange being able meet my friend Kelly who is a volunteer this year like me but living in England. We were able to enjoy this time together and share this wonderful experience. One of the many moving things about this event was seeing an almost empty space the size of 2 or 3 football fields being filled with people praying and singing in worship to God. People during this gathering are offered places to stay from local parishes and families. I stay in France in a Village called Divonne about 15 minutes from Geneva. I stay with an older retired Gentle man named Xavier and with another participant named Tomas from Poland. Both spoke very good English. We were 2 of many other people staying in Divonne during of the event. In the mornings we would spend time in prayer with the local church and break into small groups to discuss the theme the verse for the day. The songs and prayer throughout the event were in different languages and it was moving to hear them all and know that we are all have the same faith in Christ. It was also great getting to know and meet some many people from around the world. It definitely expanded my definition of church and what it means to worship God. Most people at the event spoke English but I met a rather large group of Slovaks so I was able to speak Slovak with them. Many of these same people were staying in Divonne as well. I had some free time during the event to explore Geneva. Geneva is the French part of Switzerland and was a little warmer because of the Leman Lake. I was able to see many part of the old city that included some churches that were part of the protestant movement. Most of you are if you are Lutheran are only Luther and maybe Calvin but there were many more reformers who were persecuted. Many of these reformers retreated to Switzerland for safety. It has been insightful to see and learn more about other aspects of the reformation. My New Years was spent in Divonne where our parish had a time of prayer. The prayer time was great and I felt like it was appropriate to reflect on the past year and the coming year with song and prayer. Then of course we celebrated, each country group was asked to share a little something of their culture. So everyone got a little taste of Spain, Poland, Slovenia, Austria, Germany, Slovakia, France, and many others. It was one of the best new years ever. Then next day we all said Good-bye but before we went were asked to have lunch with our hosts. So my host was invited to have dinner at a friend of his who was also hosting 3 girls from Poland. It was excellent we had Lamb and Potatoes, Green Beans, Champagne, red wine, French Cheese. What a way to start off the New Year. I had to arrive home 2 days later only because when I arrived in Slovakia there were no buses to my village. So I spend the night in Bratislava and then headed back the next day. Upon Arrival I was told I had some a lot of mail. I arrived to find at least a dozen or more cards and several packages, I forget the exact number but it was a lot. Amazing and overwhelming. I felt absolutely blessed. The cards and messages were a great encouragement and I great reminder of how many people care back home. I enjoyed packages as well, which included “Peanut Butter” among the many other goodies. Sometimes it is the simple things you miss. I want to send a big Thank You to all of you who sent me a card or package. It is truly amazing to know I am loved in this way and thought of often. In writing this letter and in Light of Christmas, New Years and the tragedies in Kenya, I want to share with you some of my reflections. When we think of Christmas we think of the Christ child and how God send his Son. This of course is a sign of Love from the Father. This is the simplest expression of the Gospel. That since Christ loved Us we should Love. We should desire to be like our Master. While at the Taiz� gathering many of the themes focused on Reconciliation. Looking to Forgive and making something new out of what is broken. Just look at the news and we see how broken the world is. We can that in the recent events in Kenya. The example of Christ is that as his disciple we are called to take the first step. In a letter written by one of the Taiz� Brothers they say, “It is not a matter of forgetting a painful past, or being blind to present-day situations of injustice. The Gospel calls us beyond the memory of wounds by forgiving, and even to rise above the expectation of getting something in return. In this way we find the freedom of the children of God.” This statement greatly challenged me. How am I supposed to do this? But, I remember it is not just me it is only Christ through me that anything can happen. It is often said, “If we think we know Jesus, READ The Gospel Again!! !” As the New Year begins I am challenged (as I hope you are too!) to really look at what our Master Jesus tells us about Love. Look at the story of the Good Samaritan (Luke 10:29-37) or Mary Magdalene (John 8:1-11). There are of course many other stories but, look at these stories with new eyes. We often forget how straightforward Jesus is about how we should Love. As the called people of God we are called to bear witness to a Kingdom of Love. Not just the Love we stereotype with Romantic love or Give everyone a big hug type love. Jesus is talking bigger and bolder. He is talking sacrificial love. The kind a Mother shows to children who get on her nerves or when a father offers forgiveness when a child has disobeyed yet again. The kind Jesus died on a cross for.